This certainly didn't help things for the Cavs. The Golden State Warriors completed a four-game sweep of the Cleveland Cavaliers in the NBA Finals with a 108-85 victory on Friday night. The Warriors were heavy, heavy favorites in the series, but many evaluators thought the Cavs could at least make it a fairly competitive series due to having the best player in the world, LeBron James. The Cavs stunningly took Game 1 to overtime at Oracle Arena, and may have won in regulation if J.R. Smith didn’t dribble the clock out. LeBron was unbelievable in Game 1, with 51 points on 19-of-32 shooting from the field. Well, the rest of the series wasn’t nearly as competitive, and while still very good, LeBron wasn’t the same player as Game 1. And there appears to be a reason for that! ESPN’s Brian Windhorst and USA Today’s Sam Amick report that LeBron suffered a serious right hand injury after punching a blackboard following the Game 1 loss at Oracle Arena. LeBron James has been playing with a serious bone contusion in his right hand since Game 2, I’m told. LeBron had an MRI after Game 1, but the hand was too swollen for definitive results. A second MRI was taken later that indicated it’s a bone contusion in the right hand. It is not expected to require surgery. LeBron James on his right hand injury: "Self-inflicted. Post-game, after Game 1. Very emotional… the way we played, the calls that were made, I had emotions that the game was taken away from us.. Pretty much played the last three games with a broken hand." 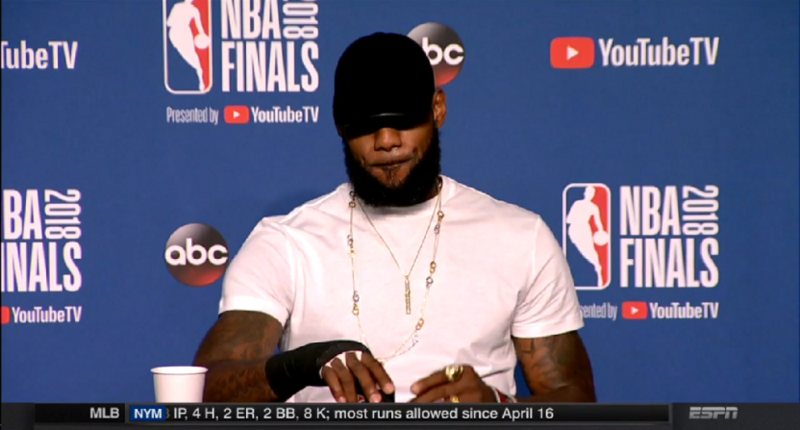 It’s hard to blame LeBron for being extremely frustrated and losing his cool, considering he basically took a team to the Finals on his own, and had a chance to win Game 1 on the road if not for a dumb decision by his teammate (while LeBron scored 51 points). And let’s be real: the Cavs weren’t going to win the series anyway, but perhaps it would’ve gone longer than four games with a healthy LeBron.